International Women’s Day (IWD) might have been born from a strike demanding better working conditions, but in the hundred-plus years since, it’s become a worldwide revolution. On March 8, people from all across the world will celebrate this monumental day in history, which matters to so many women across the globe. You might not know this, but labor is at the heart of International Women’s Day, and it’s been that way for over a century. On Friday, March 8, people all over the world will celebrate International Women’s Day, and its 2019 United Nations theme “Think Equal, Build Smart, Innovate for Change.” This year’s theme focuses thinking of “innovations that disrupt business as usual, paying attention to how and by whom technology is used and accessed, and ensuring that women and girls play a decisive role in emerging industries,” per UNWomen. By celebrating International Women’s Day, advocates for equality fight against issues still impacting women today, such as the wage gap, sexual harassment, parental leave, and more. And while women’s rights have certainly come far in the past hundred-plus years, it’s also striking that issues of work and economic empowerment are in fact… where the day began. International Women’s Day started off as a labor protest in 1908, where thousands of garment workers in New York City, including many immigrants, went on strike and marched around the city to fight for better working conditions, such as better pay and working conditions. The following year, the the Socialist Party of America organized a march to commemorate the strike, labeling it National Women’s Day, and advocating for women worker’s rights and the right to vote. The movement also managed to cross classes, according to Smithsonian.com, with women’s labor unions bringing together the mostly white and Protestant middle class reformers with the working-class women who were usually Irish, Jewish, or Italian immigrants. 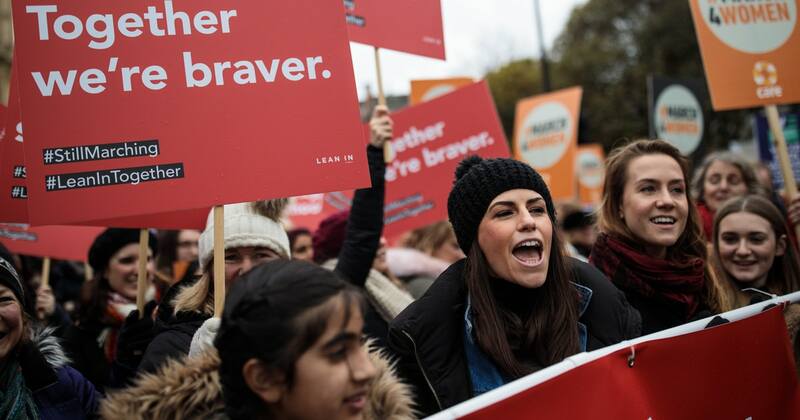 Over the next few years, women in Europe started taking a stand to demand more equality in the workplace, with the two celebrations merging together. Finally in 1975, the United Nations declared March 8 International Women’s Day. Today, however, work and economic empowerment is still a major issue in striving for women’s equality. According to Bureau of Labor Statistics, nearly 47 percent of the American workforce is female, or some 73 million women. Despite women’s prevalence in the workforce, women as a group still struggle with serious problems like pay inequality, lack of family leave, and sexual harassment. And that doesn’t even acknowledge the disparities for women from marginalized communities. Women are also overrepresented in low-wage work — according to a 2017 study from the National Women’s Law Center (NWLC), the majority of workers in low-wage jobs are female, with women making up nearly 70 percent of those earning less than $10 an hour. Women of color are also disproportionately affected — the NWLC notes that more than half of women making less than $11 an hour are women of color, despite the fact that women of color only make up about 35 percent of the national workforce. Although Black women make up about 13 percent of the overall national workforce, they comprise 18 percent of those making less than $11 an hour, while 24 percent of Latina women are making that rate, despite making up only 15 percent of the national labor pool. The fields women tend to dominate in are so structurally undervalued. According to New America, workers in female-dominated, low-wage jobs have the most reported incidences of sexual harassment than other fields. One in four women working a low-wage job is also raising a child, and more than three-quarters are unmarried (meaning they don’t have another income to rely on), per the NWLC. Given the fact that only 16 percent of workers have access to defined paid family leave nationally, per think tank AEI, this means finding adequate childcare is yet another obstacle. And that’s not even considering the gender pay gap — according to pay equality organization Narrow the Gap, women make 82 cents to the dollar men earn in the same job, and pay gaps can differ based on the field. A 2017 report from nonprofit American Association of University Women (AAUW) found that the number decreases for women of color, with Black women making about 61 percent of white men’s earnings, and Latina women taking home 53 percent. When it comes to women’s economic empowerment and low-wage work, the restaurant industry can offer a good perspective. Per the Bureau of Labor Statistics (BLS), the majority of restaurant workers in the United States are women, an industry where food service workers have a median yearly pay of just about $20,000, per BLS. The industry also is notorious for a pernicious sexual harassment problem. In order for [women] to live with dignity, labor issues are critical. “In order for them to live with dignity, labor issues are critical,” she says. “[Women] should be paid with living wages and have a voice in their job.” At ROC, Jayaraman works with her team to fight against issues plaguing women in the restaurant industry, such as sexual harassment, pay inequality, and more. According to a January 2018 report from harassment in lower-wage jobs such as hospitality and the service industry, which predominantly consist of women workers, receive less coverage than higher-income careers, despite sexual harassment being one of the leading problems within these fields. According to a 2018 report from Stop Street Harassment, 38 percent of women have reportedly experienced sexual harassment in their workplace across numerous industries, but the rates are even higher in certain fields. According to the Center for American Progress, in 2016 more than 14 percent — around 6,000 — of all sexual harassment charges filed by industry nationally came from workers in the “accommodation and food services” field alone, followed by the retail trade (some 13 percent), manufacturing (12 percent), and health care (11 percent). Added up, those four industries accounted for half of all charges filed. ROC is combatting the problem with issues like the One Fair Wage campaign, which encourages restaurants to pay workers a full minimum wage salary while also receiving tips. (Currently, restaurants in most states are allowed to pay tipped workers as little as $2.13 an hour, with the assumption that tips will increase their take home pay.) So far, seven states including California, Oregon, Washington, Alaska, Nevada, Montana, and Minnesota have passed legislation raising the tipped minimum wage. It’s a good example of how a labor law can affect the real lives of women. “Seventy percent of tipped workers today are women,” Jayaraman notes. There’s also the issue of paid family and maternity leave: about one-third of women making less than $11 an hour are mothers, and about 10 percent of them have children under four, per NLWC. And yet, only about 16 percent of civilian workers have access to paid family leave, according to a March 2018 report from BLS. For women in low-income work — who again, are often women of color — the problem can be dire. According to the Pew Research Center, only 6 percent of workers in hospitality fields receive paid family leave, while 37 percent of workers in more white-collar fields like insurance and finance receive paid leave. According to a BLS data analysis from January 2019, Black and Hispanic workers of both genders were also less likely to have access to paid parental leave than white workers, with white workers nearly twice as likely as Hispanic workers to have access to paid parental leave. “If you think about the fact that 40 percent of workers are single moms, you know, what do they do with their kids?” Jayaraman asks. A 2013 analysis from the Pew Research Center found that mothers were the “sole or primary” breadwinner for 40 percent of American families with children. In February 2018, the administration proposed to include six weeks’ paid leave for new mothers and fathers as a part of the 2018 budget. However, it hasn’t progressed very far. In July 2018, Ivanka joined Florida Sen. Marco Rubio to push for a paid family leave initiative, which would work by taking money out of workers’ social security benefits. The proposal was met with criticism that this would delay or deplete workers’ benefit checks when they retire, potentially leaving women with the choice of forgoing their needed family leave or laying the burden on their future selves. Elite Daily reached out to both the White House and Sen. Rubio’s offices for comment on the status on the initiative, but did not hear back in time for publication. Storytelling is a powerful vehicle. Both Reisch and Jayaraman agree that change can be possible. In addition to paid family leave, Reisch says that paid sick leave is also one of the issues that needs to be addressed. Currently, the United States is the only industrialized country in the world that doesn’t guarantee paid sick leave, which especially impacts low-wage workers who money relies on hourly wages and tips. “We need to accept the argument that providing these basic fundamental protections like workers being able to take a day off when they, or their family member, is sick without losing their job or income is key to economic growth,” Reisch says. In the meantime, there’s plenty that we can be thinking about. Whether it’s calling representatives about actions being taken against sexual harassment, such as the Justice Department’s Sexual Harassment in the Workplace Initiative (SHWI) introduced in February 2018, supporting city, state, or federal legislations that tackle the gender pay gap such as The Paycheck Fairness Act and The Fair Pay Act, or even making a donation to organizations that support women’s rights and or support women in the workplace. Even sharing a personal story about being a woman in the workplace can help. A small contribution can a long way. The future of women’s rights in the workforce still hangs in the balance, but the fight continues. On March 8, consider how you can do your part in challenging gender inequalities. One small gesture might make all the difference.